When I was four, I was tired of waiting for my parents to be free so they could read to me. I wanted to have that power for myself. So, I marched into my mom’s office and asked her to teach me to read. I’m pretty sure I shocked my mom — pretty sure she wanted to laugh. But, she spent a few minutes explaining the finer points to reading. What she explained was enough. I was able to get through my first picture book relatively unscathed. To say I became an avid reader at 4 would be an understatement. But then I hit 9. I stopped reading. In the 4th grade, I had a MEAN teacher named Mrs. Fox. She wouldn’t let me choose the book I wanted to read for free-read time. She wanted me to choose the chapter books OK’d for the 4th grade. Those chapter books were lame, and something I mastered by the 1st grade. Over the Christmas break in 1990, my family made the trek to Northern California to visit my favorite aunt and cousins. My mom was especially discouraged on the drive up to my aunt’s house because I was listless and bored. She asked why I was without a book. I told her that reading is boring. She about fell out of her chair. I was the kid who always had a book with her. She asked why I found reading boring, so I told her about Mrs. Fox’s book rule. My mom was MAD! She took me to a bookstore and bought me a copy of the Nancy Drew pictured above. She told me that I could totally hate reading if I wanted to, but I needed to read this book first. I told her I would, but didn’t think my situation would change. Silly me! I read this Nancy Drew cover to cover in one night. The next day, my mom bought me a few more as my Christmas present, and my avid reader status was back. To this day, I refuse to force a kid into a book just because they are at a certain reading level. If a kid wants to read a certain book, and it is appropriate, I let the kid read the book. If he or she struggles, I HELP them. I don’t make them feel less because they may not know a word or two. My goal is to make avid readers out of kids just like my mom did when I was 9. I want kids to find their “Nancy Drew” novel — that book that gets them to fall in love with reading. Do you have a “Nancy Drew” novel? So I don’t know how it works out by you, but here the elementary school has a reading level scale from A to Z for the books they can choose from. What I’ve seen is that teachers ask the students pick “level appropriate” books that are within 1 letter of their level. In some cases I understand it because there are kids who don’t understand what they are reading but don’t want others to see them reading “the baby books,” But I have noticed several instances when asking a child what their favorite books are, and they can be 3-5 letters above their level! So while reading level is important, I think comprehension can also come from reading something that’s more interesting to you. Glad your mom was able to jump in there and help you out before your love for reading got snuffed out! I’m supposed to follow roughly the same idea, but I don’t. I go with kid interest. I would rather a kid be engaged and ask me for help, then bored and hating reading. I get the “science” behind it, but my experience is that it just doesn’t work. I have a classic copy of her Mystery in the Old Clock. I read all of the Nancy Drew books, Cherry Ames, the Hardy boys, the Bobbsey Twins. If if was made for my age and reading level and was fiction, I read it, especially mysteries! To this day, my favorite genre is mystery, thriller and romantic suspense. Hardy Boys! My brother, Chris, read those like I read Nancy Drew. He loved them. It is one of my favorite memories…my brother and me competing to see who would finish their novel first. Good times! 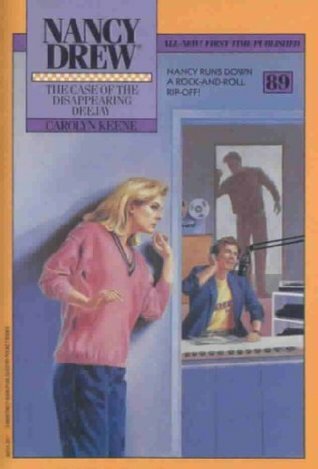 I read a Nancy Drew book or two but for some reason I was more into Trixie Belden books which I think were similar. Have a great week!